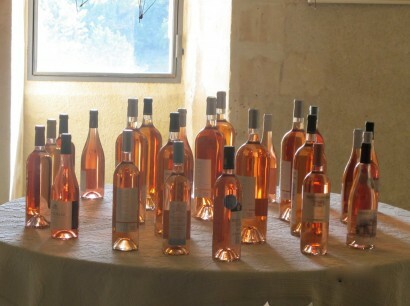 Changing Colors of Rose: Provence Wine Council (CIVP) Femininizes a Brand Image. The Lipstick Factor? Rosé is the carefree wine that you are preconditioned to order and enjoy as the typical Provencal aperitif. At first sip, everyone approves of whatever rosé is poured into his or her glass. This is a nearly universal phenomenon: a happy drink suspending any critical judgment. No inspection. No swilling. No wine angst. Rosé is also a form of wine cellar insurance. Rather than crack open expensive wines in your cellar, serving rosé at drinks parties or at casual dinners preserves your better bottles. Many wine shops in the states feature “rosé walls”: the message is pick anyone; a rosé is a rosé is a rosé. There is a commodity-like appreciation of rosé. When it comes to the color of rosés, adjectives abound. Or sometimes they don’t. When the Wine Spectator reviewed 16 rosés from Provence this summer, there was not one mention of the color of any one of the 16 rosés in the glass. Whereas this classification was an accurate assessment, several of the designated colors – think of the romantic qualities of an onion peel or a brick – lacked the imagery and emotion required for marketing the so-called Provence rosés produced in the departments of the Bouches-du-Rhône and the Var where rosés account for 87% of wine production. The Conseil Interprofessionnel des Vins de Provence (CIVP), known in the U.S. as the Provence Wine Council, represents more than 600 wine producers and 40 trade companies from the region, encompassing the Côtes de Provence, Coteaux d’Aix-en-Provence and Coteaux Varois en Provence appellations. CIVP does not market wines from Bandol. When it came to refining its marketing strategy for rosé wines, the CIVP decided to employ six descriptions, dropping apricot, lychee and raspberry, and changing pamplemousse:grapefruit to the more pleasant sounding Pomelo. If this is marketing rosé like lipstick, a more feminine brand image, can one quibble? Americans are quaffing mad about Provence rosé. As the CIPV reported, exports of rosé wine from Provence are booming in U.S., growing 62% in volume in 2011 compared to 2010, marking eighth consecutive years of double-digit growth. C’est gigantesque comme chiffres. Among the wine growers in the Bouches-du-Rhône and the Var, rosé wines are a cash flow fix as they are sold within a year of bottling. The boom finds them “in the pink,” and I hear they’re lov’n it. This entry was posted in Wine and tagged Rose, Wine. Bookmark the permalink.